Kyiv’s Maidan has really proved to be a lasting affair, strong enough to manifest the will of the majority of Ukraine’s population. Everyone could see the evidence of its ability to stand against police forces. Even during calm periods Maidan is still an impressive sight. For those of us who are used to spending most of our time on the Internet, getting to Kyiv’s Maidan feels like diving. Emerging from the subway in the city center actually turns into a deep submersion. The sense of clarity and understanding, seemingly provided by ‘navigation devices’ – social networks and information web-portals, instantly disappears when one is on the streets. You are there and you have to reconstruct on the spot a whole new and different picture of the Maidan’s world and of what really happens there. You begin to understand that the indicators generated by the devices we are so used to are nothing more than indicators. Here, the rich and dense picture of virtual Maidan is broken into pieces – from virtual reality to actual people and particular spaces and objects. In contrast to the comfort of a virtual protest this causes a slight panic, anger, despair and even a sense of powerlessness and alienation. Of course, you try hard to disperse all doubts and weakness, but they are still with you, following you like a little cloud. This ‘submersion’ syndrome can be overcome only by one simple method – you have to walk, talk and see more. Kyiv’s Maidan is a special world with its inner principles of operation and rules of conduct. Arriving here you expect to see an immense united crowd engaged in some sort of synchronized protest actions. But instead you find yourself in a different reality. Your understanding of Maidan will be determined by your experience of being inside of it. This experience can be quite different for various people. Everyone chooses their roles, as if in a computer role-playing game. You can be a ‘curious passerby,’ ‘just another protester’, or a ‘convinced supporter’, ‘Maidan resident’ or ‘volunteer in the kitchen’, ‘member of the self-defense units’ or ‘participant of the Cabinet of Ministers of Siege’. You can just stand there quietly. You can shout slogans or give speeches using a stage with a microphone. You can cut sausages in the volunteer street kitchen or eat it as a consumer; you can play the piano at the occupied Kyiv City Council. 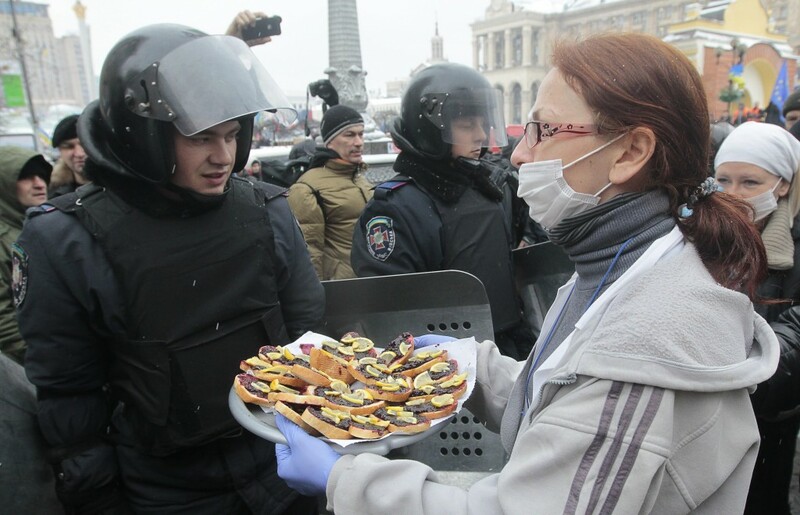 The world of Maidan is diverse and the experiences it offers are multiple; probably, too numerous for one person. However, the decision to play one of these roles is only situational. It may change any minute. Maidan is a living organism, not a frozen mechanism. You came to have a look at the Pillar Hall of the City Council or at the medals and vases exhibited in the Council’s corridors (so as not to miss the opportunity while people have open access to this building), there you met some friends among rioters and all of a sudden you are staying there for the night as one of them. Or, as you were passing by Bankova Street, you were hit with a riot policeman’s club and all of a sudden you are going to Maidan to help installing barricades. Speaking of the stage, if you visit Maidan as a ‘curious passerby’ or ‘just another protester’ the stage can leave quite a gloomy impression. From the loudspeakers you hear a kind of a strange populist hotchpotch: archaic slogans and outdated appeals, pretentious statements and corny poetry, rough nationalist rhetoric and psychotherapeutic prayers. These ‘speaking corners’ are surrounded by little crowds of people who seem quite satisfied with what they hear. However, after a while you realize that, fortunately, all these hollow speeches are just one of the many facets of Maidan. Moreover, it is by and large far from the most representative of its facets. If you imagine Maidan as a living body, the cries from the stages are merely a vapor in the frosty air. The general rhetoric of Maidan is different. The stage is only a background for real work and real talk. The main discourses and narratives of Maidan are produced in the immediate process of communication between people without the aid of microphones or loudspeakers. It is really cold now on the streets of Kyiv. And it gets even colder if you are just standing in one place. After a few hours spent here you start to understand that the most positive experience of Maidan is a cup of hot tea offered to you by a complete stranger. It gives you much more pleasure than a sandwich with salmon that, if you are lucky, you may get at one of the ad hoc open air food courts run by volunteers. If you spend a few days on Kyiv Maidan, it will turn into a truly magnificent sight. Here, on the regular city streets and squares the new organism is living and developing. A few weeks ago, it was just a usual city with its buildings, pedestrians, and traffic. But now behold these everyday items miraculously transformed into a colossal living being. What you see on Maidan compels you to describe it as an organism, a super-human figure. To protect themselves from the harmful governmental institutions the Ukrainians have created a sort of artificial giant, whom they endowed with their own bodies, souls, minds and wills. And it really works. ← Season’s Greetings and Happy New Year 2014!